We are at our best when among friends. As we enter our 31st season, Amici Chamber Ensemble invites you to enjoy our legacy of innovative, evocative programming and our passion for presenting the best chamber music and musicians. This season we welcome back old friends and new, all counted among the world’s best chamber musicians. We also look forward to welcoming several recent graduates to the Amici family and hope to be able to continue providing mentorship and opportunity to these exceptional up and coming musicians. To start off the year, we are pleased to present our fundraising gala, L’Invitation au Château in September at the elegant University Club of Toronto. This year’s event will be an art filled gala soirée, including a full concert experience, reception, 3 course dinner and a spectacular dessert buffet. We look forward to spoiling our guests while also raising essential funds for Amici. In November, we explore intercultural harmony and co-existence with Convivencia, an academic hypothesis regarding Spanish history in which Muslim, Christian and Jewish people lived in harmony. This concert will focus on Spanish, Arabic and Jewish music. Concert goers will then enjoy the serenades of a master with Mozart’s Party in February. This composer focused concert presents the grand celebration of the renowned masterworks of Wolfgang Amadeus Mozart, one of the most prolific and influential composers of the classical era. In March, we present The Mystical and the Macabre, a musical expression of opposites with a unique program featuring the mystical juxtaposed with the |macabre and an exploration of the overwhelming contradictions that come to all of us on a daily basis. The season ends in April, with a celebration of chamber music genius. Beethoven’s Best is another composer focused program, presenting the innovative works that represent Beethoven’s genius at the highest level. Amici has been making music for 30 wonderful years and we would like to also thank you for taking this journey with us. 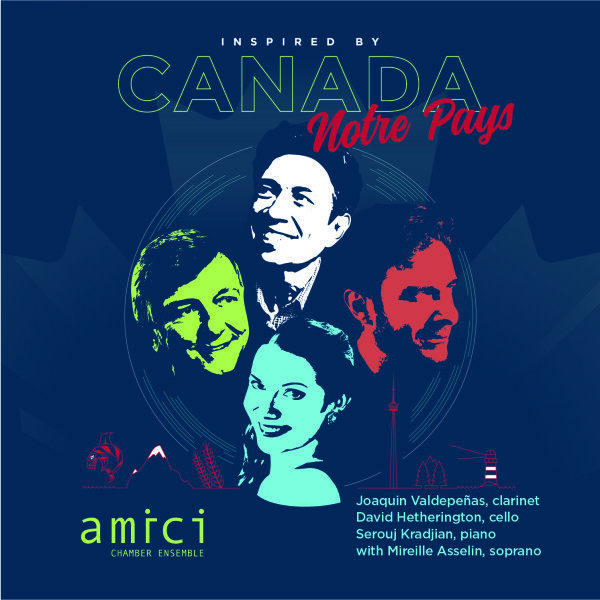 This last season was a great celebration of our legacy here in Toronto and we couldn’t be more pleased with the new Inspired by Canada/ Notre Pays recording as well as the diversity of the season. As you know, it has always been our goal to produce inspiring programming combining the most revered classical compositions with more adventurous music to delight our audiences. We look forward to the next decade making outstanding music together.